At the Central Florida Zoo in Sanford, there is so much to do! Of course, the main attraction is the 400+ animals, some of which include cheetahs, kangaroos, leopards, and Maude, the long-time resident Asian elephant. This zoo also contains the Southeast’s largest collection of venomous snakes and non-venomous reptiles in the Herpetarium. You can even learn some things about bugs at the Massey Services Insect Zoo. Along with the amazing animals, this zoo boasts beautiful, lush botanical gardens. You can also bring your bathing suit and cool off in the Wharton-Smith tropical splash ground. Included with regular admission, everyone will enjoy cooling off on those hot summer days at this watery, animal-based playground. You may even try ZOOm Air Adventure Park, which is an aerial adventure course featuring zip lines and rope bridges, so you can experience the zoo from an animal’s perspective – in the tree tops! There are three tree top courses available; including a kid’s course (must be 36” tall, separate admission). There are even night-time aerial adventures available. The zoo also offers Battlefield Live Orlando Laser Tag, summer camps, birthday parties, volunteer opportunities and more! This zoo was originally opened as the Sanford Zoo in 1923 with a collection of donated animals held by the Sanford Fire Department. It was relocated later and has been at its present site since 1975 and it continues to grow as Seminole County’s premier recreational and educational attraction. 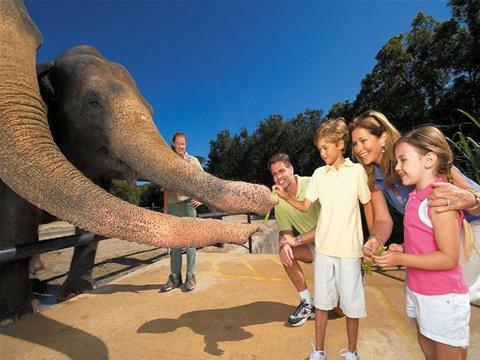 The Central Florida Zoo & Botanical Gardens’ most visible role is to provide its guests with recreation and the opportunity to observe and learn about its unique and interesting animals. One of the Zoo’s most critical functions is to provide a refuge for animal species that are threatened in the wild. You even have the opportunity to adopt an animal! Central Florida Zoo and Botanical Gardens is located at 3755 NW Hwy 17-92 Sanford, FL, approximately 32 miles from the Orlando tourist area. For more information about the Central Florida Zoo, visit their website, or type in ‘Zoo’ in our search (top right) to read more articles about this attraction. Feel free to leave a response below about your visit to the Central Florida Zoo and share your tips and experience!